With the exception of Vitamin C Coca Cola released last year, Coke has pretty much been sitting on the sidelines while Pepsi's been getting all the attention with its bizarrely flavoured drinks. The verdict is still out whether Pepsi is doing its image any good by mixing itself with various colours and chemicals, but Coke has finally decided to show Japan that it is just as capable of making a silly flavoured cola as anybody else. Maybe even better? I guess I'm going to find out. Far from being exciting, this whole idea of releasing your product with different colours and flavours is nothing new. Kit Kat paved the way and now it's pretty much the only marketing strategy available to snack food companies in Japan. Everywhere you look, chocolate bars, chips, drinks, etc, are all going off the flavour deep end. Unlike Pepsi though, whose three short lived flavours didn't have any connection to Japan itself, Coke is taking something that Japanese people truly love, and mixing it with caramel colour, fizz and sugar. Sure it's bold, but it's analogous to doing something dumb like putting a piece of sashimi in a McDonald's hamburger. In other words, it'll be good for a few laughs but not much else. Nothing new here. 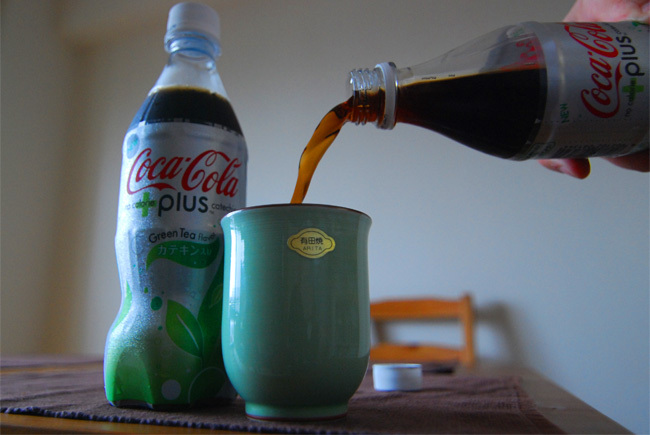 Green Tea Coke is the same colour as the regular stuff. I guess Coke wanted to be different than Pepsi and its groovy colours, which I can respect, and went for a more 'subdued and serious' image. This might work for a bottle of wine or whiskey, but as a rule, soft drinks aren't serious things. I for one wanted green Coke. Diet Coke with extra aspartame is what comes to mind. Although green tea extract is listed in the ingredients, my tastebuds strained themselves to the limit of their powers to detect some a hint of tea flavour, and failed. To be fair, it's not bad tasting, but even though it supposedly has catechin in it (like anyone is really going to switch from tea to Coke to get their antioxidants), Green Tea Coke seems to be pretty green tea-less. Not to be rude Coke, but I'm not sure I understand what the point of this drink is, or why you even bothered? We'll see if Pepsi does a better job in a week or two when it releases its new summer flavour: 'shiso' (beefsteak plant).